Dr. Rob participating in the Ride 2 Survive event in 2016. Summer is almost upon us, and we have some exciting events happening at Panorama Chiropractic and Laser Health Solutions in the month of June! In celebration of Father’s Day, we have a “Dad’s Night Out At the Movies” draw. Don’t forget to enter your name when you visit the office. 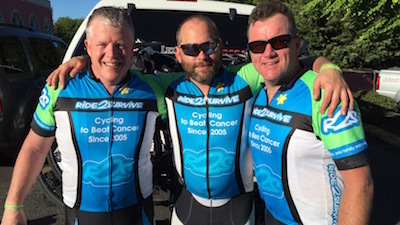 We are very excited to support our practice members Mitch and Tom on their upcoming Ride 2 Survive, an epic 400km, 1 day cycling ride from Kelowna to Vancouver on June 23, 2018. 100% of all funds raised supports the Canadian Cancer Society. Please call our office if you wish to help them with their cause. Dr. Rob completed the same ride in 2016 and was a crew volunteer last year. Summer is in and flip-flops are out. Wondering what to look for in supportive sandals? We have answers. And don’t forget to join us for our informative laser therapy workshop on Thursday, June 14th at 6:15 pm!